A democracy is a government whose powers are created by the consent of the governed as expressed through fair and free elections. All citizens are considered equal, and their voices carry equal weight. It is no secret that the United States does not function this way. It wasn’t until 1868 that the 14th amendment guaranteed all citizens equal protection under the law, and it took our country until the Voting Rights Act of 1965 to even approach having free and fair elections. For centuries, the voices of wealthy white males have weighed more than those of women, people of color, or low-income workers. Even today, voter ID laws, cuts to early voting, and gerrymandering mean our elections remain unfair—the voices of many continue to be suppressed and silenced. In North Carolina, for example, electoral districts used since 2012 include twenty-eight racial gerrymanders—districts created in ways that unconstitutionally undermine voters of color. Even the new electoral lines, supposedly drawn to correct this problem, still include twelve districts that are either racial gerrymanders or otherwise violate the state constitution. Meanwhile, in Texas, a federal court ruled that two of that state’s districts were unconstitutional racial gerrymanders that discriminated against Hispanic voters. On September 12th, however, the Supreme Court blocked this ruling, meaning that these discriminatory districts will remain in place until the Court hears appeals. As a result, the 2018 elections in Texas may well be conducted with these illegal districts still in place. Moves to actually create a more secure voting system are not being taken seriously; for example, even mere debate on Klobuchar-Graham amendment to the defense bill—which would have taken steps to secure our state and local election systems from foreign influence by helping states block cyber attacks, by securing voter data and registration logs, and by upgrading election auditing procedures—was blocked because lawmakers could not agree on which amendments were worthy of getting floor votes. And, of course, Trump’s voter fraud commission is working to disenfranchise citizens rather than to secure the right to vote. The commission has set its sights on the National Voter Registration Act of 1993, which bars states from forcing new voters to provide proof of citizenship, and, most recently, the commission is considering the idea of requiring that every citizen pass a federal background check in order to be able to participate in the most basic tenet of democracy. Yes, that’s right, the same folks against background checks for gun-owners are in favor of them for folks simply exercising their fundamental right to vote. Even so, don’t despair. As I mentioned in my last post, admirable legislation is out there too, and we can urge our representatives to support it. 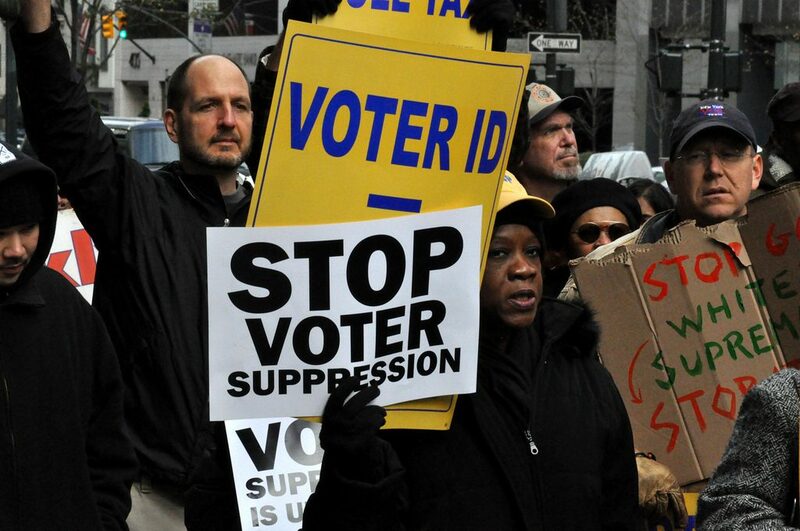 One example is the Voting Rights Advancement Act of 2017 (H.R.2978/S.1419), which would strengthen the federal government’s ability to stop discriminatory voting practices in states and localities. The bill would proscribe last-minute polling-location changes (which have been used to deter minority voters), impose more oversight in states and localities with a pattern of discrimination, and improve voting rights for Native Americans and Alaskan Natives. We can protect the sacred right to vote by urging our representatives to stand up for this core value of democracy. Call: Your state’s head of elections (use the list below the map to find your state’s elections office website ). Fill out this form and Secure Our Vote will provide you with information about how to get involved in the campaign for election security in your community.